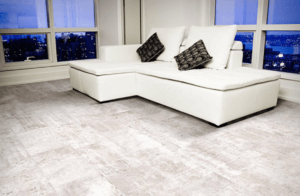 Many similar attributes can be found in porcelain and ceramic tile , however neither should be discounted when you are considering what to select for your project. It is common to use a combination of the two when designing your project. A good example is using porcelain on the floor and ceramic on the walls. Ceramic can certainly be used on floors in some cases, but in high traffic use areas porcelain is the material that we recommend. Both ceramic and porcelain are made of a clay mixture. The advantage that porcelain has over ceramic is being part clay and part mineral (feldspar). Porcelain is pressed at a much higher strength making its breaking point much higher than ceramic tile. In Porcelain tile, a PEI rating of 4 or 5 are most commonly used in commercial settings with high traffic areas and in ADA applications. If you are in the market for a commercial project give us a call at 919-876-5997 and ask for our commercial sales rep to assist you! Porcelain is harder and denser than ceramic. Porcelain tiles are frost-resistant, and often frost-proof. If this is a concern for you be sure to ask! Highly stain, scratch and moisture resistant. Porcelain is able to handle harsher cleaning products, heavy loads and fire. 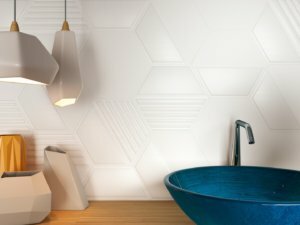 Why would I choose tile over carpet or hardwood? Ceramic and porcelain products do not retain dust or residue as easily has other flooring. They do not need polishing or buffing and can be cleaned with common household material. Often a broom and mop with water will do the trick! Resistance to stain can vary between different tiles. Glazed tiles and even some unglazed tile resist all types of stains and can be easily cleaned. Practically, slip and skid resistance needs to be made based on the environment in this area. How likely is the floors exposure to spills and what is the environment of the room? The more water your floor is exposed to, the higher the slip resistance needs to be. Very basically, a highly glazed tile on a bathroom floor is a NO-NO. A second factor to consider is whether you have children or elderly in your home. Color permanence is high because color is fired into a tile’s clay body. (For glazed tiles it is fired onto a glazed surface.). Thus, color does not fade if exposed to direct sunlight. They are permanently color fast. The surface of ceramic and porcelain tile does not easily retain germs or allergens, nor do they absorb fumes or odors. This factor is a high consideration in any area where cleanliness and hygiene are of the upmost importance. We hope that you have some answers to the differences between Ceramic and Porcelain. For help with your next project, feel free to call us or use THIS online form to schedule an appointment.